Captain's Log Starship 1XE, Day 19 in the month of July in the Earth Calendar Year of 2016. Public lands are owned by "All Americans" and I'm not talking about a group of college sports figures. I'm talking about your average everyday Joe who is fortunate enough to be an American citizen with a legacy of public lands that are "owned by all Americans". 1xe once again finds itself floating like a butterfly over some incredible landscapes in Montana and sending back revealing images (stinging like a bee) that help to inform public opinion on challenges and opportunities up in the Blackfoot and Clearwater watersheds. This landscape is adjacent to some well-known wilderness areas in central Montana called the Bob Marshall (the Bob) and the Scapegoat Wilderness where "a River Runs Through It" (the Robert Redford Movie featuring the Blackfoot River, one of the great trout fishing streams in the U.S.) It is situated in one of our Last Best Places and it is currently at the center of some of the most respectful conversations, collaborations and creative public land management we are seeing in the lower 48. The North Fork of the Blackfoot River is a land echoing the same wild beauty of the Bob, but was not included when the Bob was protected. The West Fork of the Clearwater is critical spawning ground for bull and cutthroat trout, native fish with severely threatened habitat. The West Fork abuts the Mission Mountains Wilderness. These areas provide critical connectivity for wildlife movement and migration. Public lands are contentious and complicated issues and the Blackfoot Clearwater Stewardship Project is a classic made-in-Montana project. Timber industry reps, snowmobilers, outfitters, backcountry guides and conservationists are collaborating to create a legislative proposal for a landscape-style approach to balance the needs of timber and restoration, recreation and conservation. Our flights gathered up stakeholders, spokespeople and media for a look at these mid-elevation lands that border the Mission Mountains, Bob Marshall and Scapegoat Wilderness areas. We deemed our mission a success with the parade of newspaper articles, radio and tv spots that aired following the flights. A broader take away is that these are public lands and public lands are increasingly in the forefront of the discussions in the conservation and political arena. There is talk afoot in Western States of selling off our federal public lands to the states, who in most cases do not have the financial resources to manage them properly, so the lands would then be sold to private interests in the hopes of producing income from public land resource extraction. If this land grab happens, these lands that are your lands will therefore probably no longer be anyone's lands other than industries' lands. 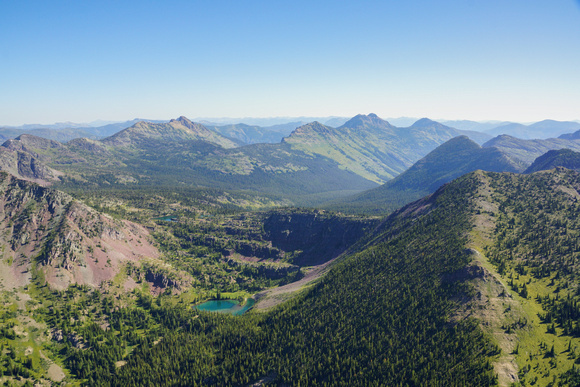 Up in Montana the issue of public lands is a mainstream issue that Governor Bullock is running on and is a hot topic for both political parties. Montanans value the quality of life that goes hand in hand with their spectacular public lands and understand this is not a partisan issue. Not so in all other states. In my home state of Colorado we have a champion for good stewardship of public lands, who is listening to the people and understands that these lands are owned by everyone and they should not be sold or monopolized for private resource extraction. Gail Schwartz and Scott Tipton are running for U.S. Congress in the 3rd Congressional District of Colorado, and it is my hope that everyone who loves our landscapes, whether they hunt, fish or hike, bike and climb on these lands, will educate themselves and understand the importance of these areas to our American heritage, and vote accordingly. As you know, at EcoFlight we work on many public lands issues in the West, from the Cabinet Mountains up north, to the Owyhees on the border of Oregon and Idaho, to the Bears Ears in Utah and the lands surrounding the Grand Canyon, hundreds of important issues in hundreds of important places. A recent decision by the BLM regarding oil and gas drilling on public lands in the Thompson Divide underscores my point. The BLM listened to the public and cancelled 25 illegal leases in the Thompson Divide. Listening to the people is what politics should be about, as we the people own these lands. My hat is off to Gail Schwartz for supporting this important landmark decision. As in every November election I urge everyone to educate themselves on the issues and advocate ....VOTE!